This morning brought this year’s Accreditation results. The press release tells us the new “Federal Accountability” data are up as well. The feds present a moving target: The current Every Student Succeeds Act of 2015, ESSA, is the successor to the No Child Left Behind Act, NCLB. Hey! I didn’t invent these silly names. Talk to your Congressman and Senator. VDOE has a summary of the ESSA and the timeline for transition to the new system. Of interest here, they have a current list of “Priority” and “Focus” schools. Priority schools must engage a state-approved turnaround partner to help implement a school-improvement model meeting state and federal requirements. Focus schools must employ a state-approved contractor to help the division develop, implement and monitor intervention strategies to improve the performance of students at risk of not meeting achievement standards or dropping out of school. As well, there are other schools that haven’t met the old federal standards but aren’t listed because of the changing legalscape. 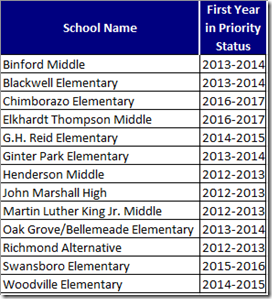 You may recall that Richmond has a total of 44 schools this year, 2.4% of the statewide number. 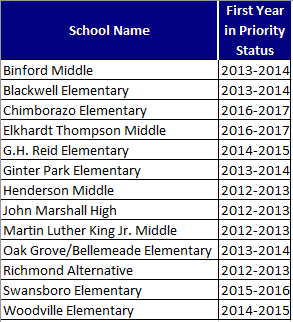 It seems we have had Priority Schools since 2013 and Focus Schools since 2015. Stay tuned for an analysis of how those schools have performed.